A 10 metre long adult male sperm whale (Physeter macrocephalus) has live stranded at Cunniger spit, Nr. Dungarvan, Co. Waterford today. A flurry of phone calls yesterday evening (18/08) first alerted the IWDG to the presence of a large whale in some difficulty off the east side of the Hook Head peninsula in Co. Wexford. The IWDG confirmed from photographs that the animal, which within 30 metres of shore, was an adult sperm whale, the world’s largest predator. Sperm whales typically stay in deep water well off shore, where they hunt at depths in excess of 1,000 metres for large prey animals like giant squid. Sperm whale strandings aren’t that unusual in Irish waters. 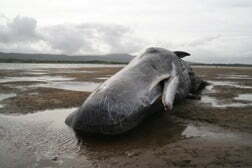 With 67 recorded strandings to date they are the second most frequently encountered stranded whale species in Ireland. “Live strandings” of this deep-water species are however extremely rare. The IWDG reports that the last live-stranded sperm whale was in Magheroarty, Co. Donegal in April 2007, and that only one previous validated record exists for the Southeast region from September 1993 at Kilmore Quay. As of 14:30 this afternoon the stranded sperm whale was still alive, but the prognosis doesn’t look good. The IWDG confirms that there is no effective way of refloating an adult bull Sperm Whale, which can weigh up to 50 tonnes, and points out that an animal that has ventured into shallow water is likely to be severely compromised, and is probably a dying whale that simply hasn’t expired yet. You can read an up to date account of the stranded sperm whale on the IWDG website.